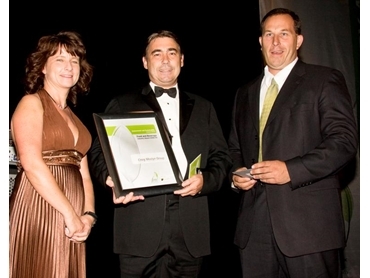 A diligent and innovative approach to recycling by the Craig Mostyn Group (CMG) has been recognised when it received the inaugural Food Industry Association of WA Environment and Sustainability Award. CMG is WA’s largest processor of fresh pork and a major exporter to Asia. CMG has transformed a potential source of environmental pollution – waste water from its Linley Valley, Wooroloo, pork processing operation – into a valuable recycled water resource for the nearby El Caballo Golf Course. It has also diverted 10,500 metric tonnes per year of carcase waste material from landfill, rendering it into animal feed material. If left as landfill, the waste could have degraded into leachate and gas, potentially polluting the local environment for decades. “CMG has always taken its social and environmental responsibility very seriously, so it was gratifying to see our efforts to make pork processing more environmentally friendly and sustainable, recognised,” CMG Executive Director, Andrew Mostyn said. “Our staff and management have worked very hard to overcome a number of difficulties and setbacks to achieve a result that not only recycles our waste water, but keeps the local golf course in great condition. “Recycling carcase waste prevents tonnes of carbon dioxide, methane and ammonia from eventually ending up in our atmosphere and water. “CMG continues to consider ways to reduce water use and greenhouse gas emissions, but meanwhile we’re proud of our recycling efforts to successfully reduce environmental impact and, in at least a small way, even benefit the environment we operate in,” Mr Mostyn said.